Many of you are already in love the UDPP, but there is a new version hitting the market. 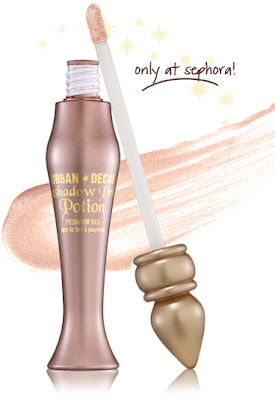 The new Urban Decay Primer Potion will still be used to prevent creasing and to extend the application of your eye shadows, but it will now include a shimmery champagne hue. If you have a Sephora Beauty Insider's card, you can make your purchase online now before the product is available to the public. Will you be purchasing the new potion? I have recieved your emails and comments and I will respond asap. ive never used it but ive heard so much about it. i guess im the wait-til-i-can-get-a-sample type. idk. I love the original, looking forward to this one. I've never heard of this, but I won't buy it, I'd probably never use it. Never heard of it but seems fun to try. Antithesis You can always get a sample from Sephora even the old version is cool. Great Just me, I can't wait for your review.